Is all water created equal? Not when it comes to a car wash.
Rainy weekends may seem like the solution to a car owner’s car wash troubles—however, rain can actually be what stops a vehicle from getting clean. In fact, wind, rain, and other storm related weather makes cars dirtier in most cases. Wind can pick up particles from the ground and transfer them onto the metal of a vehicle. This can cause scratches and other damage—not to mention an unsightly exterior. Also, rain can react with the dirt on the vehicle. This reaction can result in things like chipping paint and corrosion. Dirt can also weaken paint—which not only makes the vehicle look old and worn, but can also hurt resale value later. Another fact about rain is that it can be acidic, especially in and around large cities. According to the Environmental Protecting Agency of the United States, normal rain is “slightly acidic” due to the levels of carbon dioxide that dissolve in the liquid and form “weak carbonic acid.” Even if a car owner is outside a city, rain by nature is more acidic than water used at a professional car wash. Imagine how acid rain can impact a vehicle over time. The damage is often permanent and costly to repair. The good news is that there is an easy way to prevent weather related damage. 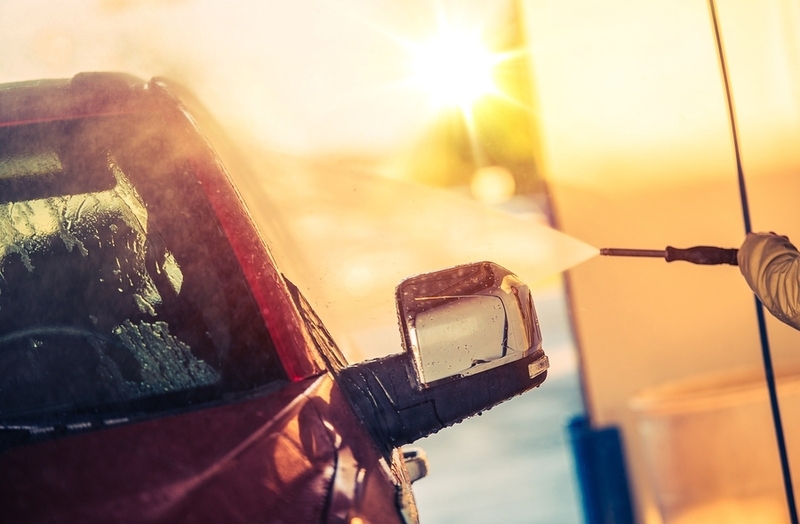 A car owner should always take their vehicle to a professional car wash. High water pressure is extremely important while cleaning a car because it helps prevent scratches and other damage. Rain simply cannot provide the right amount of pressure needed to clean a car properly. In addition, high water pressure allows the dirt to be removed safely, so the car is left in the best possible condition. Another factor to consider while looking into getting a professional wash is soap. Water alone cannot leave a vehicle in prime condition. A vehicle needs the proper products in order to look like new. Letting the rain do the washing will eliminate soap (one of the necessary products needed to protect the vehicle) altogether. Don’t leave it to the rain, bring the car to Mr. Clean Car Wash. With a host of wash packages ranging from a quick shine to an all over detail, there’s a Mr. Clean Car Wash package for everyone. Right now get $5 off a Signature Shine.